Well, I’ve been busy, but I still read a lot of awesome books. With two months in one go, this is going to be a long post, so strap in and let’s get right into it. This is one of those books that ever since I’ve heard of the concept I’ve wanted to check it out, but I’ve never been that motivated. This story is about aliens landing in a medieval German village and the local priest convincing the town to see these strange beings as people rather than demons. It’s not the type of first contact setting that we see a lot of. Not saying it’s a unique idea; Poul Anderson wrote about aliens meeting knights in The High Crusade back in 1960. But it is an interesting idea and I love how Flynn has presented it. 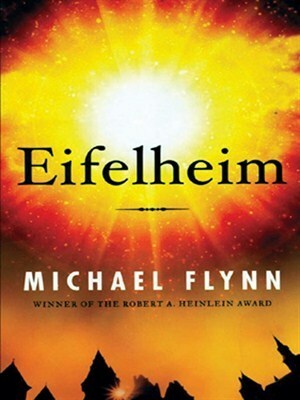 Eifelheim began as a 1986 novella about an historian and a physicist each pondering mysteries that tied into what happened to the village of Eifelheim back in the 1340s. This novella has been incorporated into the novel as the ‘Now’ sections of the book, which serve as a present day framing story for the 14th Century alien portion of the book. I wasn’t a big fan of the ‘Now’ sections, and found myself wanting to get back to the ‘real’ story whenever they came up, but I must admit the story wouldn’t have been so intriguing or the ending so strong without them. A strange thing about this book is that it tells you pretty early on how the story will end. Since we are reading about the events in the middle ages, we know that the answer to the mystery of the ‘Now’ section is aliens, and because the big mystery of the ‘Now’ section involves the desertion of Eifelheim, we soon realise what’s in store for the characters we’re following in the middle ages. Also, there was a certain historical event that happened in the 1340s that we know from the start is going to affect our characters big time. In effect, this book spoils itself, and strangely enough that isn’t a bad thing. There’s no big twists, because if we’re paying attention to what’s going on we can figure out a lot of the reveals before the characters do, but seeing the characters respond to these reveals, and even wondering how they’ll even uncover them when communication is such a problem makes for an interesting read. This book is meticulously researched, showing the reader every detail of life in a medieval feudal village. In a way, that’s good because it makes the scenario and the characters feel very real. On the other hand, I felt the book got bogged down in the little details at times. There was one part where characters were at the lord’s table discussing politics for so long that I just zoned out. Flynn’s research makes the story feel like an accurate, non clichéd depiction of Medieval Europe. The importance of logic and reason during this age is highlighted in a way that we rarely see when talking about the ‘Dark Ages’, and whilst there is a lot of primitive superstition involved, Flynn also shows the positive side of religion in this time. As well as getting the facts right, Flynn also does an excellent job at getting us inside the heads of the medieval characters. Their worldview is just as alien to us as that of the actual aliens, and it made for a very engaging and thought-provoking read. Finally, as an atheist, the fact that Flynn wrote a book that made me happy to see aliens converted to Christianity shows how much skill went into this story. Maybe it’s a stretch to call this book steampunk, but there are certainly elements of the genre in here. There are airships, mechanical arms, massive steam engines and while the setting is not explicitly Victorian in it’s setting and sensibilities, the setting does have an old-time feel with no modern technology and history that feels more like fantasy. Goodreads has it listed as Steampunk, so I may as well tick it off now, but I may try reading a more explicitly steampunk book later for that challenge. 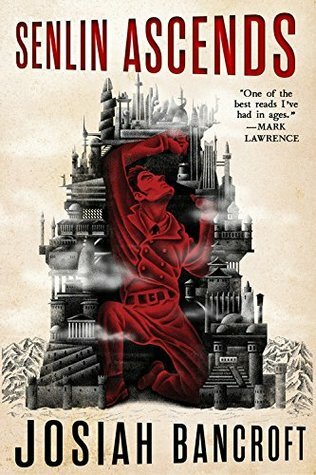 As for the book itself, Senlin Ascends is a fantastic adventure through the Tower of Babel, an ancient wonder that is a whole world onto itself. The titular character, Thomas Senlin, takes his wife Marya to the Tower for their honeymoon. The honeymoon is ruined within hours when the two get separated by the huge crowds. Senlin, realising that he has both train tickets and his wife is stranded at the Tower without him, sets off to find her. This simple sounding task is complicated by the fact that Senlin’s guidebook forgot to mention that the Tower is a hive of treason and villainy and that climbing it is going to be one hell of a quest. I enjoyed this book a lot. A lot of great worldbuilding went into making the Tower, and Senlin really has to go through a lot of changes to find Marya. We only see the first 4 floors of the Tower, but already we can see this massive world full of wonder. It’s all a lot of fun, though some things can feel a bit contrived. All in all, I love this book, but I’m not sure yet if I love it enough to commit to a four book series. Which is a problem because the ending of Senlin Ascends really does need to be continued. A month after reading, I feel I probably will continue the series at one point, but it hasn’t yet sucked me in and made me impatient for more like some other series have. Oh, and Senlin Ascends was originally a self-published book before getting picked up by Orbit, so if you like unique adventures and want to show some love to self-published writers, definitely give this book a go. I think I’ve already committed myself to reading everything Yoon Ha Lee writes from now on, but I think the premise of Dragon Pearl would have sucked me in even if I didn’t know who wrote it. This is a story about Min, a Gumiho (fox spirit) who lives on a backwater planet and must hide her magic. 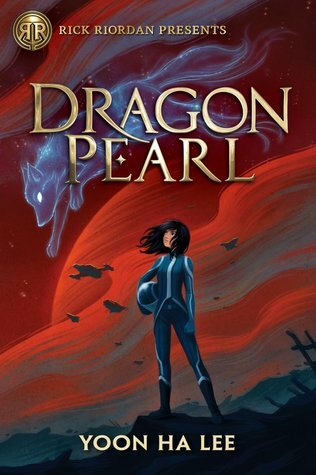 When she hears her brother Jun has deserted his post in the Space Forces to go looking for a magical dragon pearl, she knows something is wrong and goes to save him. This is a Korean fantasy crossed with space opera; a specialty of Yoon Ha Lee, but not something I’ve seen from anyone else. Most of the action takes place on a battleship, and whilst the story has all the hallmarks of military science fiction, there are also dragons and tigers and goblins and ghosts aboard this ship, and it feels like they belong in this SF setting. If I had to pick just one scene to show how the science fiction and fantasy elements entwine so seamlessly, I’d go with the part where the ship is under attack and Min and another cadet are assisting in engineering. Whilst the ship has the conventional wires and panels, it’s main source of power is chi, and it has chi lines (like a reiki thing.) Min monitors and adjusts the chi energy from her computer, and because the ship’s chi corresponds to the chi lines of a living person, Min is in danger of ‘synching’ with the ship, and any injury the ship gets will affect her. Min’s shapeshifting powers could have been a mess in the hands of a lesser writer. She just has to think of what she needs and she’ll automatically transform into the perfect illusion. Her charm also allows her to convince people of nearly anything. There was a risk that Min would be able to charm or shapeshift her way out of any situation, but Lee set just enough limits to make her believable and the danger seem real (conjured objects disappear when not on her person, some characters can detect magic, using magic drains energy etc.) Given the ethical dilemma of constantly deceiving people, Min also ends up in situations where she questions whether she should use her powers in certain ways. Her powers are very convenient, but nothing she does ever feels like an asspull. Dragon Pearl is aimed at a much younger audience than what I usually read. More a children’s book than YA. Because of this, I felt that some things may have been dumbed down or over explained. Not sure if that is the case or if I’m just not used to reading stories aimed at younger readers. As much as I loved the Machineries of Empire series, the way it plunged readers into strange concepts and societies with little explanation was a bit overwhelming at times, so Dragon Pearl was a welcome change of pace. If Machineries of Empire didn’t do it for you but you still want to check out Lee’s work, this could be a good place to start. …though, also any Yoon Ha Lee short story you find online could work as well. Maybe even better. 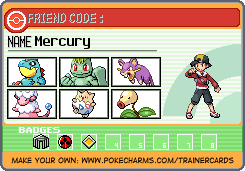 Point is, Dragon Pearl is awesome. 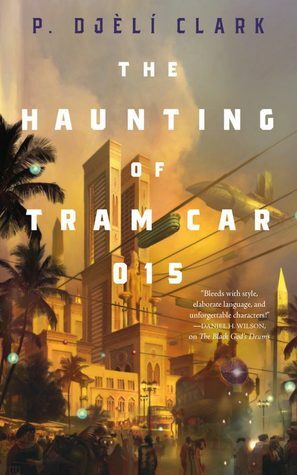 The world of Tram Car 015 is an alternate 1902 Cairo where Djinn and magic have been unleashed. With the aid of Djinn magic, Cairo has become one of the most industrialised and prosperous cities in the world. It’s also a rather progressive place, with the world’s first vote on women’s suffrage taking place as the story of Tram Car 015 unfolds. In this Cario, magic is so commonplace that there is a Ministry of Alchemy, Enchantments and Supernatural Entities that investigate any paranormal problems. Our story follows two agents as they investigate the titular haunted tram. Despite trams being an unusual spot to become haunted, they don’t at first think that this case will be too difficult. Soon however it becomes apparent that there is something dangerous in Tram Car 015 that could threaten the whole city. In the two novellas by P. Djѐlí Clark I’ve read so far, I’ve been swept away by a type of magic I haven’t encountered often. I’ve read historical fantasy before, but P. Djѐlí Clark’s stories make the magic and mythology truly world-changing. I love how much Tram Car 015 and The Black God’s Drums turn the world upside-down, with the magic not just adding to the story, but changing who gets to shape the world. In my first draft of this review, I wrote the title of this book as ‘City on the Edge of Forever’. And that isn’t the first time I’ve mixed up the title. 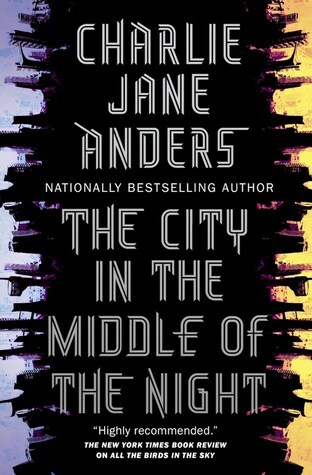 Last time I read anything by Anders, it was her award winning debut novel All The Birds in the Sky, which was a charming, enjoyable mix of science fiction and fantasy. City in the Middle of the Night is firmly on the SF side, giving us a heartbreaking drama on the tidally locked planet of January. First off, I loved the worldbuilding here. Anders has thought hard about not just the physical aspects of life on a tidally locked world, but also how an unchanging sky would affect humans. Phrases such as ‘walking from day to night’ take on a very different meaning, and the lack of natural indicators of the passage of time affects every aspect of life. Early in the book, we are in a room where a gap in the shutters allows a beam of light to reach into the room. Since the sun doesn’t change it’s position, this beam has been constantly hitting the same part of the wall with the same intensity for years, causing the paint to flake. I loved this detail, because it is a very good way to get the reader to realise the implications of a world of perpetual light. I also liked the main character Sophie. She goes through so much, and suffers from PTSD. Despite this, she is still able to grow and try to make her own destiny. Discovering this world through her eyes was amazing. Mostly, this was a well written, captivating book. Though I’m not sure how I feel about the ending yet. What? Everyone knows about Bohemian Rhapsody. It’s like, the best, most famous song ever written. I’d rather highlight one of the more underrated gems.